Laura Swan arrives at Wilsons by electric bike. To my mind the world has always been divided into those who cycle to work and those who don’t. Prior to joining Wilsons, I would have placed myself firmly in the latter camp. Coming from a long line of couch potatoes, our family pursuit of choice was Monopoly and the most active part of our holidays was identifying the shortest route to the nearest cream tea. I could just about ride a bike, but cycling on roads was an alien concept – something that the super fit did. Besides, it seemed dirty, smelly, dangerous and I couldn’t imagine why anyone would want to get to work sweaty? I also held a deep-seated fear of ‘helmet hair’. So, all that said, this week has been a significant milestone for me. I cycled to work. In fact, I cycled to work twice and lived to tell the tale. My excuses for avoiding cycling have worn thin over my past year at Wilsons. I only live 3 miles from the office and there are cycle lanes for most of the journey. There are showers at work and a secure bike store. The firm actively promote cycling and even provides regular on-site maintenance. There is a supportive community of about 20 staff who regularly cycle to work and don’t seem to have ‘helmet hair’. The one remaining obstacle was my fitness, or lack thereof, after a prolonged bout of glandular fever last year. I had heard of electric bikes which could make cycling more manageable, but there was no way I was going to invest heavily in one without trying it out. So, when a friend told me about the Cycle Enfield scheme my final excuse evaporated. 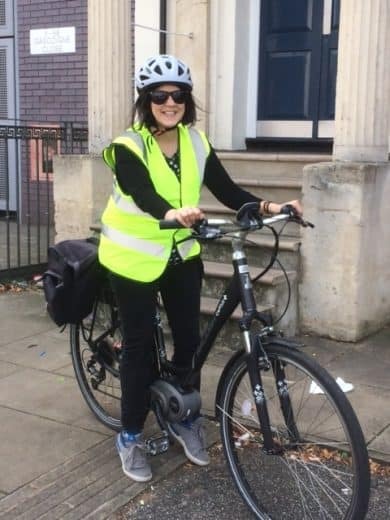 Amazingly, I was able to trial an electric bike (for a month for £10. It was a Raleigh Captus electric bike. They even threw in a helmet, jacket, lights and offered free cycling lessons run by Cycle Confident volunteers. Contrary to popular belief, you do have to actually use the pedals to move an electric bike. There are, however, different engine modes that provide a speed boost and take the edge off hills for people like me who aren’t quite at the peak of physical fitness. I got to work in the same amount of time it takes me to drive, but the real benefits paid off when I halved my commute home and cycled merrily past the queues of traffic I am usually stuck in. I arrived home early, energised, and happy that I had managed to fit some exercise into my day. I was also relieved to find out that the underpass on the A10 roundabout is actually an open, well-lit and well-planned route and not, as I had imagined, the gateway to Mordor. Sadly, my trial ended this week and my lovely electric bike has been returned. I am now seriously considering buying one through the Cycle to Work Scheme but, as I am still very much a fledgling and fair-weather road cyclist, that might have to wait until Springtime!